Antigua golf apparel has been reviewed on THP for many years, and each time we get a new piece of clothing we are reminded of how consistent they are with their quality and design. This is not a brand that will ever knock you off your feet when it comes to design, but I think some might appreciate that about them. What they will do, is always offer quality, well fitting, well acquainted apparel that will please the masses. This time around we received a new top from their 2018 line, and a repeat in bottoms, but a welcome one, with their Cinch Skort. I wrote about this skort in the last review, but I will recap it here again. “92% polyester/8% spandex Desert Dry™ Xtra-Lite D²XL moisture wicking knit jersey skort with elastic tie detail at front with cinching capability. Self fabric waistband with shirring. Stretch knit undershort. 17? full body length”. Adorable does not even begin to describe the Cinch skort, in fact, there are at least 50 adjectives I could use. 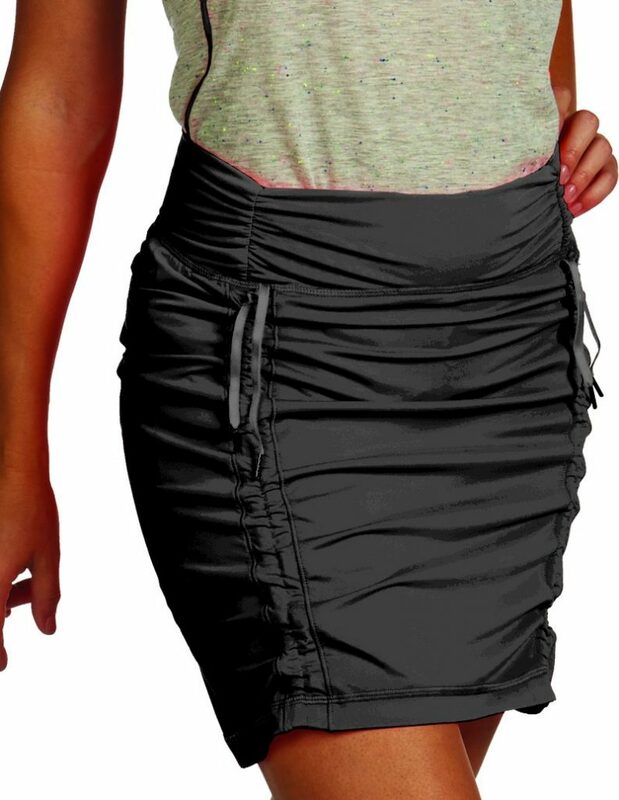 Simply put, the Cinch skort can be cinched up to take it from plain to party in just two seconds. Over the years, we have talked about multi-purpose apparel that can be worn both on and off the course, and I think this skort might be the epitome of that. My absolute favorite feature is the elastic waistband. No nagging zipper issues at all here, no trying to figure out orientation, if it is sticking out, why it is digging into you, thankfully none of that exists here thanks to the oh-so-comfy elastic waistband. Additionally, the comfort of this skort was elevated even more by having looser fitting shorts underneath, so you don’t feel like you are wearing Spanx that are cutting off your circulation. Lastly, the 17” length allows for a modest look if someone prefers, but if they do not then they can literally just cinch it up! The Cinch skort is available in nine different colors (we received black), ranging in size from S-XL, and retails for $65. New for their 2018 line is the Wildfire polo. 54% polyester/41% rayon/5% spandex closed mesh pattern knit with heather effect short sleeve polo. Holographic print at top of sleeves. Holographic zipper placket and self fabric collar. 3D holographic A logo at right sleeve. Available in five different colors and ranging in size from S-XL, the Wildfire polo has the most unique texture I have come across. The closed knit gives almost like a waffle weave look, which I think will create polarizing opinions from the consumer. As a fan of V-necks, I am not sure how I feel about the zipper placket. In theory, the idea of being able to control how much skin is shown is quite appealing, so this will make a lot of people happy, but the zipper ads a little harshness to the top that others might dislike. This will definitely boil down to personal preference. I think polarizing is going to be the main word for this top, because it straddles the line between edgy and contemporary. Seeing is believing, so this might be one to pick up at your local club or retail store to really get the full effect. Fit wise, it is right on point. Not too form fitting that you can’t swing, but still structured enough that it gives the body shape. It’s also not too long that you couldn’t leave it untucked, but just long enough that it could also be tucked if the person prefers. This polo is definitely versatile enough to be worn both on and off the course, upping its consumer appeal. The Wildfire retails for $70. As always, Antigua continues to offer quality apparel that can appeal to a wide audience. The two items provided for this review would definitely lean on the less ‘classic’ side, but to repeat myself from earlier, is just polarizing enough to still catch the eye of the more traditional buyer. For more information on Antigua’s 2018 line, you can visit their website at www.shop.antigua.com. Great review Morgan! I will share it with my wife as she still claims she is going to take up golf. Cute golf clothes may pute her over the edge! Nice write-up Morgan. The addition of the spandex and poly make these great athletic apparel pieces. The price points are competitive for the market as well.